Hacksaw Ridge is the story of a man who sticks to his beliefs, no matter what the odds. These beliefs also seem to contradict the responsibilities he has been given when he signed up with the military to defend his country. Hacksaw Ridge is based on the true story of Desmond T. Doss (Andrew Garfield), who is a conscientious objector due to his religious beliefs. We follow his story from when he is but a small boy and how events in his youth and young adult life shapes his views and faith, especially the basis of his religious beliefs about not killing. His beliefs are put to the harsh test during his trials and tribulations during basic training after enlisting in the US Army and trying to become a medic. His stance on not wanting to touch a weapon earns him a boatload of grief and near torture from his training officers, his peers and the upper echelon of this squad. 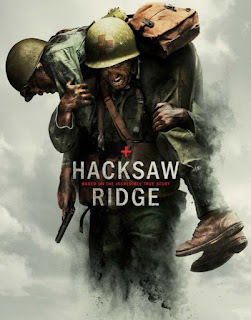 But once he gets over the hurdle of his peers perceptions and basic training, we follow him into the gruesome hell that is Hacksaw Ridge during the Battle of Okinawa. After all was said and done, Doss became the first man in American history to receive the Medal of Honor... without firing a shot. The Congressional Medal of Honor was awarded to Doss for his incredible bravery and regard for his fellow soldiers. The film is directed by Mel Gibson and the cast includes Andrew Garfield, Sam Worthington, Luke Bracey, Hugo Weaving, Vince Vaughn and a pile of others. Following Doss through his youth and basic training, we're given a good perspective on his motivations and his tenacity to stick to his beliefs. Even during the third act we're still taking time to learn about him. The battlefield scenes were only a small part of the movie gruesomely authentic as we watched servicemen die by explosives, brain splattering bullets, bayonets and what not. The message was clearly And what was interesting was that the battle was not all about Doss, but everyone around him. You start to wonder as Doss saves and helps a few here and there, what the big deal was about this young man, but when the unit retreats from the ridge and he finds himself left behind and stuck up on the ridge, this is when he earns the recognition, as a sole human on a ridge full of enemies working to pull out as many men as he could, who were otherwise thought dead or left behind for dead. In the face of adversity like no other, he selflessly saves man after man, finally earning the admiration and respect of his (surviving) fellow soldiers, all the while, leaning hard on his own faith and devotion that led him to not carry a weapon in the military. It takes a little getting used to, watching Garfield flinging out a southern accent, but it grows on you and Garfield delivers the power of his convictions wonderfully. This film felt like it was right in Worthington's wheelhouse while Vaughn didn't exactly sway my imagination as a drill Sargent. He makes a great criminal crime boss or comedic lead, but not quite a soldier. What made this film even more amazing were the interviews of the soldiers at the end of the film, the soldiers who lived through this, including Doss himself. It was an amazing film to experience, with the interviews of the vets truly making it all come together. Hacksaw Ridge received an 8.1/10 om IMDb and 86% on Rotten Tomatoes. I do not disagree!